Why do I get an error that "The license installed on this computer is too old to run this version of MacVector"? If you can't find the e-mail, please contact support@macvector.com with the License Owner and Serial Number of your copy and we will resend the updated activation code. 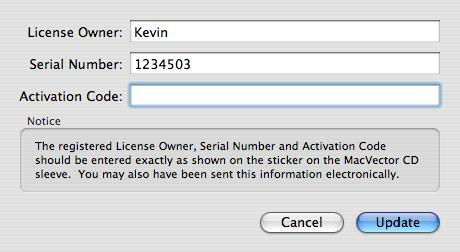 ...the chances are you entered the License Owner incorrectly. Make absolutely sure you copy/paste the License Owner EXACTLY as sent to you - the text of this is used as a key to decrypt the activation code. Its is case-sensitive and a single extra space or period will cause the decryption to fail. 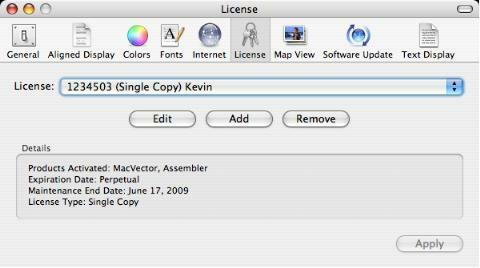 Once you have activated the license, you should be able to click "Apply" or simply close the Preferences dialog and your MacVector 11 license should be active.